Most people think building better habits or changing your actions is all about willpower or motivation. But, the more I learn, the more I believe the number-one driver of better habits and behavior change is your environment. Anne Thorndike is a primary care physician at Massachusetts General Hospital in Boston. Recently, Thorndike and her colleagues completed a six-month study published in the American Journal of Public Health. Thorndike and her team proposed that by changing the environment and the way food was displayed in the cafeteria, they could get people to eat healthier without thinking about it. 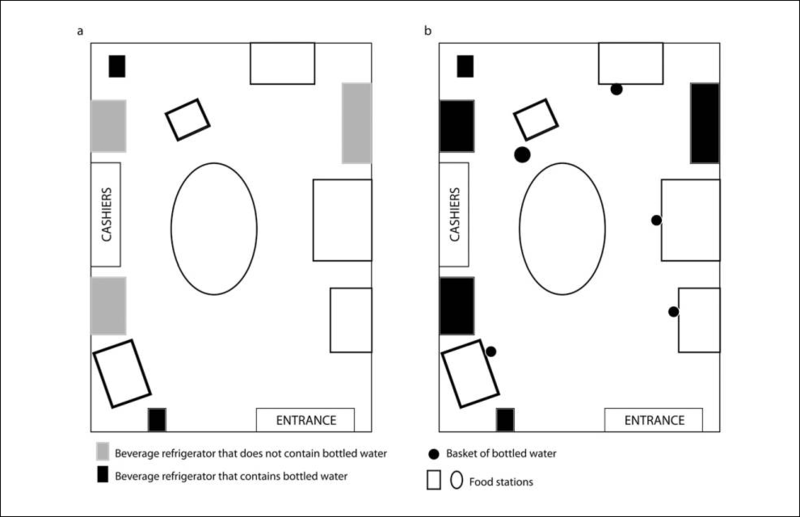 The researchers started by changing the choice architecture of the drinks in the cafeteria. Originally, there were three main refrigerators, all of which were filled with soda. The researchers made sure water was added to each of those units and also placed baskets of bottled water throughout the room. The image below depicts what the room looked like before the changes (Figure A) and after the changes (Figure B). The dark boxes indicate areas where bottled water is available. Over the next three months, the number of soda sales dropped by 11.4 percent. Meanwhile, bottled water sales increased by 25.8 percent. Similar adjustments and results were made with food options. Nobody said a word to the visitors who ate at the cafeteria. The researchers simply changed the environment, and people naturally followed suit. The usual argument for sticking to better habits is you need more willpower, motivation and discipline. But, studies like this one showcase just how important your environment can be for guiding behavior. Decades of research has revealed that willpower is not something you have or don’t have, but rather, it is a resource that can be used up and restored. Like tired muscles at the end of a workout, your willpower can become depleted if you use it too much. Much of this research is explained in books like, "The Willpower Instinct," by Kelly McGonigal, and "Willpower," by Roy Baumeister and John Tierney. A classic example can be found by looking at college students. During finals week, students use all of their willpower to study and everything else collapses as a result. People eat whatever they can find; students who haven’t smoked all semester start lighting up outside the library, and many people can’t even muster the strength to change out of their sweatpants. There is only so much willpower to go around. We don’t typically think about willpower and motivation as a finite resource impacted by all of the things we do throughout the day, but that’s exactly how it works. And, this is where choice architecture and willpower come together. When your willpower is depleted, you are even more likely to make decisions based on the environment around you. After all, if you’re feeling drained, stressed or overwhelmed, you’re not going to go through a lot of effort to cook a healthy dinner or fit in a workout. You’ll grab whatever is easiest. And that means if you take just a little bit of time today to organize your room, your office, your kitchen and other areas, that adjustment in choice architecture can guide you toward better choices, even when your willpower is fading. For example, in Richard Thaler’s best-selling book, "Nudge: Improving Decisions About Health, Wealth, and Happiness," he discusses research that reveals items on the top shelf of supermarkets (near eye level) tend to sell more than items on lower shelves. It’s easy to apply this discovery to everyday life. Simply place healthier foods in more visible spots in your refrigerator, pantry and around the kitchen. Meanwhile, you can tuck away cookies, treats and other unhealthy choices down on the lower shelves. This is one way to use choice architecture to make it more likely you’ll grab healthy food, even when your willpower is fading. Like the visitors in the hospital cafeteria, choice architecture can help you automatically do the right thing without worrying about willpower or motivation. If you design your environment to make the default choice a better one, it’s more likely you’ll make a good choice now and have more willpower left over for later. Environment design works. Talking about tiny changes, like moving your healthy foods to a more visible shelf might seem insignificant, but imagine the impact of making dozens of these changes and living in an environment designed to make the good behaviors easier and the bad behaviors harder.